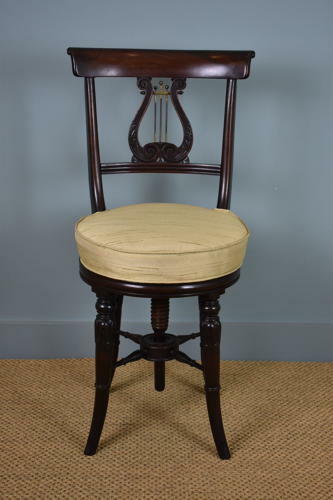 An exceptionally fine quality, Regency period 'Harpist's' chair crafted from rosewood of lovely colour and figure. The back, with attractive carved lyre motif, rises from a revolving seat which adjusts for height. The four legs are ornamented with an acanthus motif and are joined by a cross-stretcher for additional stability. The design, quality of craftsmanship and choice of timber all suggest that the chair is by the highly reputed furntiure maker, Gillow of Lancaster and London. Circa 1815.